Finding holiday decorations that are modern and fit in with my existing decor can be somewhat challenging; my tastes lean more toward Swanky Penthouse or Groovy Downtown Loft than Santa’s Workshop or Rustic Cabin. I also change the colors of my decorations every year. This year the combination is gold, silver and white. 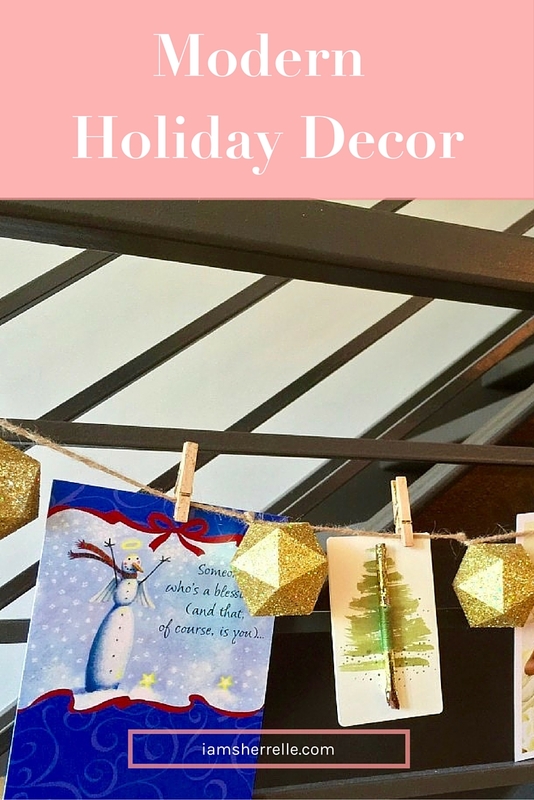 How can I make those colors modern holiday decor? My favorite places to look for modern holiday decor are: West Elm, CB2, Crate & Barrel, Anthropologie, Ballard Designs, local home design boutiques and of course Target who knocks off everyone else. Although stores like TJMaxx, Marshall’s and Home Goods cater more toward to the tchotchke crowd, it’s worth a look; often times I get lucky. Since I don’t have a fireplace anymore, I used my coffee table as a display surface. The gold tray and silver box are always on the coffee table, but everything else was added for Christmas. I even changed out the coasters, although since they fit with my overall decor I will keep them out after the holidays. I love that the trees all have different textures. I added the peace wreath this year and I love it so much that it will be a permanent decoration and I will just take off the lights. I love the scale, it’s huge and makes a statement at the top of the stairs. I am always on the hunt for a great tree skirt that doesn’t look like an Ugly Christmas Sweater and I love this faux fur version; I see myself using this for many years to come. Swanky. 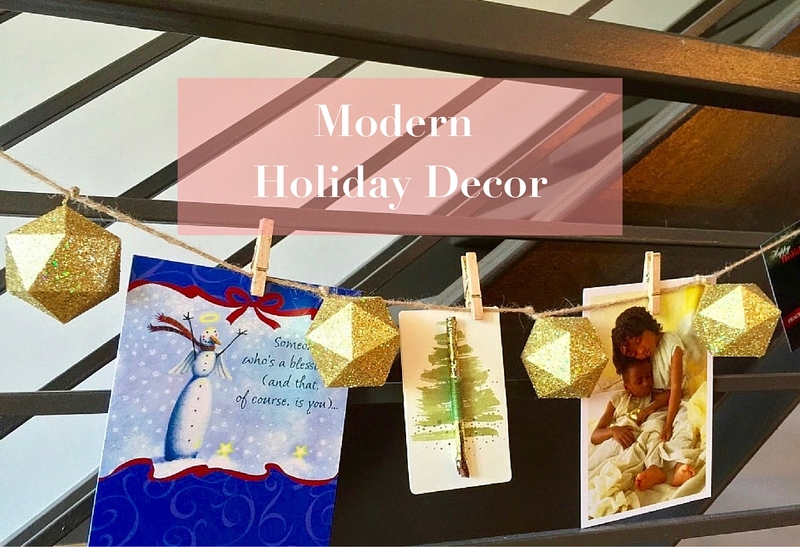 Hanging this garland of gold geometric cubes on my bannister instead of greenery keeps with my color scheme, is modern and also allows me to display holiday cards. This red cabinet is a focal point in the room, so I thought it needed decoration. And finally inspired by store window displays, I had the bright idea of stringing gold snowflakes from track lights in the ceiling with fishing rod line. Not such a bright idea because it was tedious and sort of dangerous, but hey it looks great. As I have shown it’s possible to decorate for the holiday season and still retain the personality of your modern home! Santa Claus: A Holiday Tradition Or An Elaborate Lie? I have that gold garland! It’s up surrounding my desk for now. Love your decorations. Very seasonal, but cool! I like how you put the wreath up on the art wall. Love the tree skirt. My dog would think that should be his new bed. My dog usually tries to drink the water under the tree, but I think he is afraid of the tree skirt – he hasn’t gone near the tree this year at all!